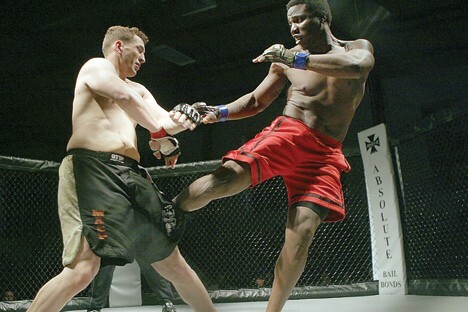 FORT RILEY, Kan. -- Fort Riley wasn't a very cordial host to its visitors during the post's first mixed martial event. 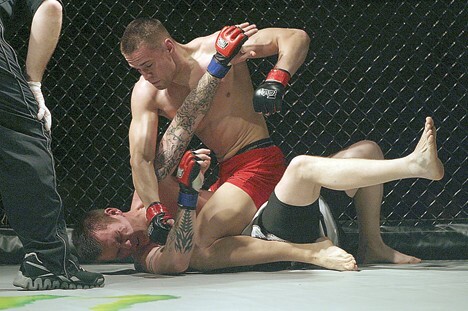 All five Fort Riley fighters who competed in the 11-fight event sent their opponents home with a loss. About 800 fans attended the first United Fighting Federation's Fight at the Field House Feb. 19, at King Field House, here. Of the five Fort Riley competitors, four are part of the 1st Infantry Division All-Army combatives team, which is coached by Joe Wilk of Manhattan's Combative Sports Center. Wilk had four fighters from his gym who also participated and won. "Eight and zero speaks for itself," Wilk said. "Eight wins and zero losses. That's just kind of how we do it around here. We show up prepared, and we win fights." Spc. Rusty Morris, Headquarters and Headquarters Company, 4th Infantry Brigade Combat Team, 1st Infantry Division, entered the event as an independent and won his 145-pound fight by a unanimous decision. "My dad was a professional kick boxer, and he's trained me since I was little," Morris said. 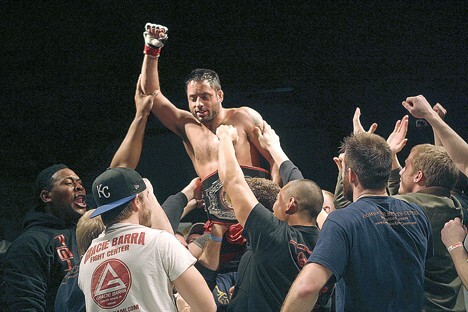 "This is my first MMA [mixed martial arts] fight. I've been training really hard for the past two or three years for this, so it's been a long time coming." 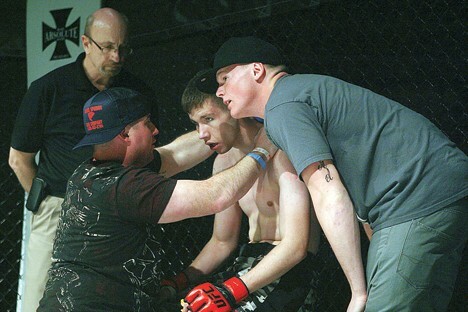 This was the first MMA fight for each of the Fort Riley Soldiers. "It's a whole other level, because in the Army, they're all trained what you're trained, so they all come at you with basically the same game plan," said Spc. Israel Lopez, Company A, 2nd Battalion, 34th Armor Regiment, 1st Heavy Brigade Combat Team, 1st Inf. Div. "Fighting a civilian, I don't know what game plan he comes with, so I don't know what he's good at, and I have to think quickly." Spc. Charles Gualtieri, HHC, 2nd Battalion, 16th Infantry Regiment, 4th IBCT, 1st Inf. Div. said he feels the everyday training Soldiers experience in the Army gives them an advantage. "I felt like I fight a lot stronger guys in the Army, just because of what we do every day," he said. "We do (Physical Training) in the morning, training all the time, and I definitely feel like Soldiers are a lot stronger." Pfc. Hans Haken, Co. A, 2nd Bn., 34th Armor Regt., 1st HBCT, 1st Inf. Div., said being an infantry Soldier helped make him stronger. "We all train as much as possible as far as our military job goes," he said. "I'm an infantry (Soldier), so every other day, we're in the field, cooking in the sun, eating (Meals Ready to Eat) and trying to keep a regular diet. " He said the members of the 1st Inf. Div. All-Army combatives team and the Combative Sports Center fighters work together, making them all better. "We're all close friends and stuff," Haken said. "We all train together, work together. The guys I work with are real good guys and well rounded in martial arts. It's just great to work with all of them because I pick up things from all different people - different techniques and different styles of fighting." Gualtieri gave a lot of credit to Wilk and his assistant coach. "We had great coaches," he said. "They really trained us well. If it wasn't for them, we wouldn't be where we are today." Nikolas "Taco" Garret, a 170-pound Army veteran who fights with the Combative Sports Center team, won the title fight against Dalton Goddard of Team Kayo. Tony Dong, UFF president, said he was impressed with the undefeated performance from the 1st Inf. Div. All-Army combatives team and Combative Sports Center team. "That says something about the Army training and about what Joe Wilk is doing and the dedication these Soldiers have," he said. "Some of these other clubs need to take notice and start bringing some heat." Dong hopes to bring the UFF back to Fort Riley. "Hopefully they'll have us back because we loved it," he said. "We had a good crowd, and it's been in our experience that after the first taste of something like this, people come back in droves. So yeah, we definitely want to do it again." The Fort Riley Soldiers look forward to the opportunity. "As long as I get to represent Fort Riley as many times as I can, I'll do it as many times as I can," Lopez said. "This is my hometown right here. I'm from Chicago, but hey, I'm based out here, so I gotta fight for Fort Riley."